Since you'll be living in a dorm that's maintained by your school, you probably won't be expecting to fix water pipes and adjust air vents in your dorm room—and you're right, as these tasks should be handled by building maintenance. However, that doesn't mean there won't be instances when a few tools will come in handy. For example, those dorm appliances that you bring might not make it through the whole year ... or at least not in their original condition. What if that college mini fridge's light burns out? Or what if that old video game console starts acting up? 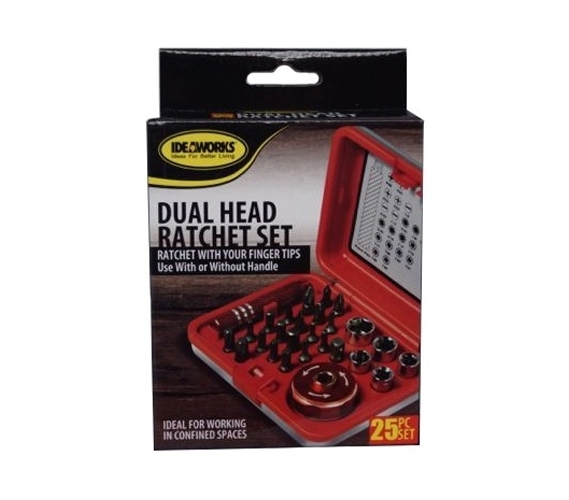 You'll need a few basic tools for some basic repairs, and this Dual Head Ratchet Set - 25 Pieces will provide just what's needed. If you're not even sure how to use a screwdriver, college is always a good opportunity to learn new things! From flashlights to sound speakers, so many basic dorm items might require a few basic tools to maintain and operate. If that sink starts leaking, notify your school's maintenance department. But if you need to change the batteries on something and need to loosen some screws, you should be able to handle the task yourself. C'mon, you're in college! You'll still need the tools for some of those tasks, however, so don't forget to add this set to your college supplies list.